First of all, let’s just clarify that this recipe is not for a real salad. It is for a dessert. It is called a salad in the sense that Jell-O with fruit or nut bits mixed in is known as a Jell-O salad, gelatin salad, or congealed salad (that name gives me the “no” feeling). My grandmother had a whole box of these gelatin salad recipes. Some of the combinations made no sense to me like grated onion in lime Jell-O with a tuna topping. 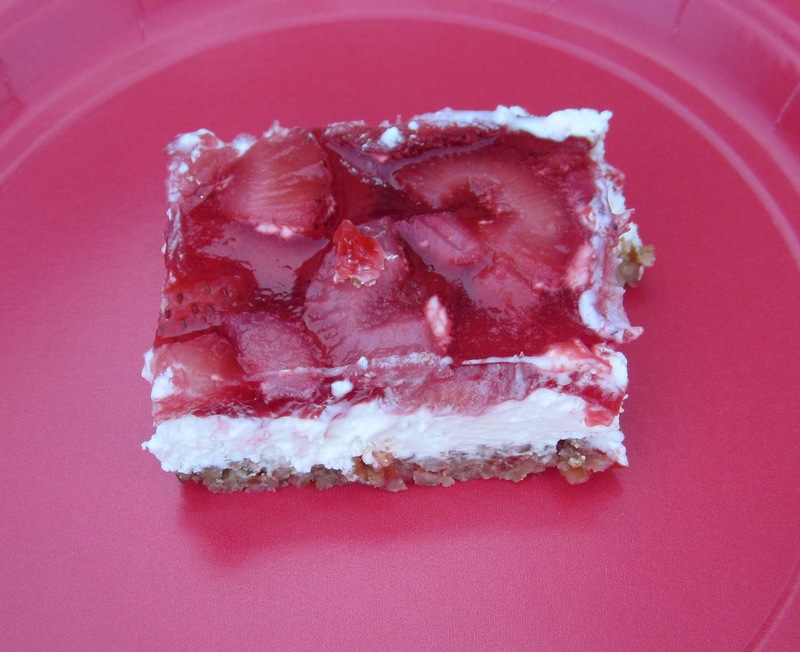 I am happy to report that there is nothing repulsive about this strawberry pretzel salad. 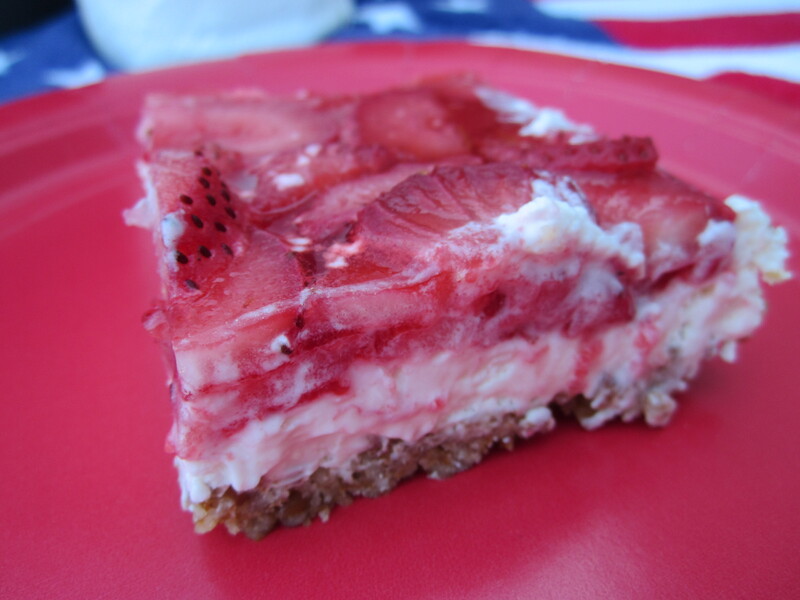 It is delightful and delicious, and it was the perfect ending to our neighborhood 4th of July parade and feast. 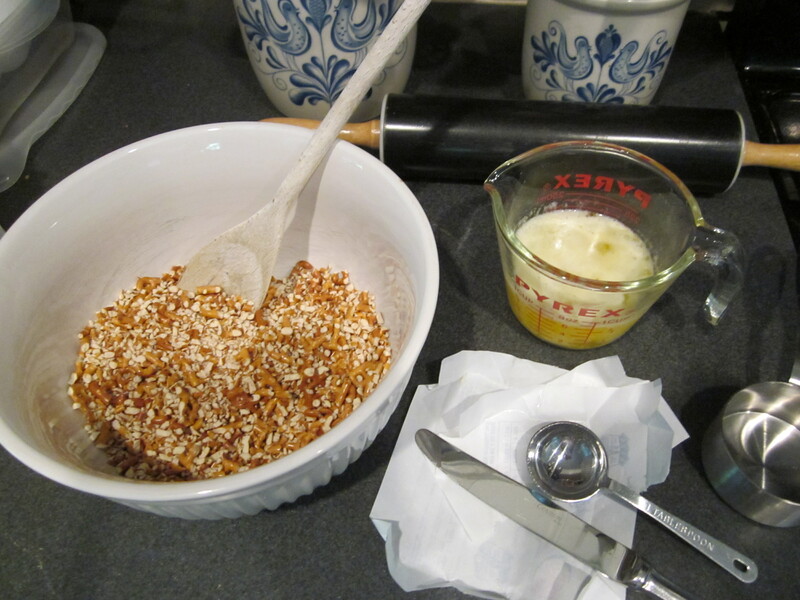 In a bowl, pour the crushed pretzels and 1 cup sugar and stir to combine. Add the melted butter and stir again until mixed thoroughly. Press the pretzel mixture on the bottom of a 9×13 pan and bake for ~8 minutes. 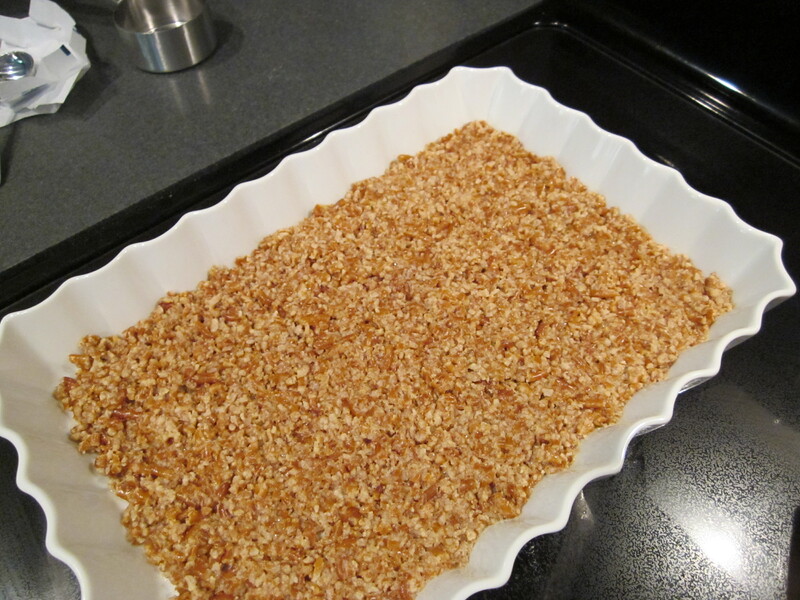 Remove pretzel crust from oven and let cool completely. 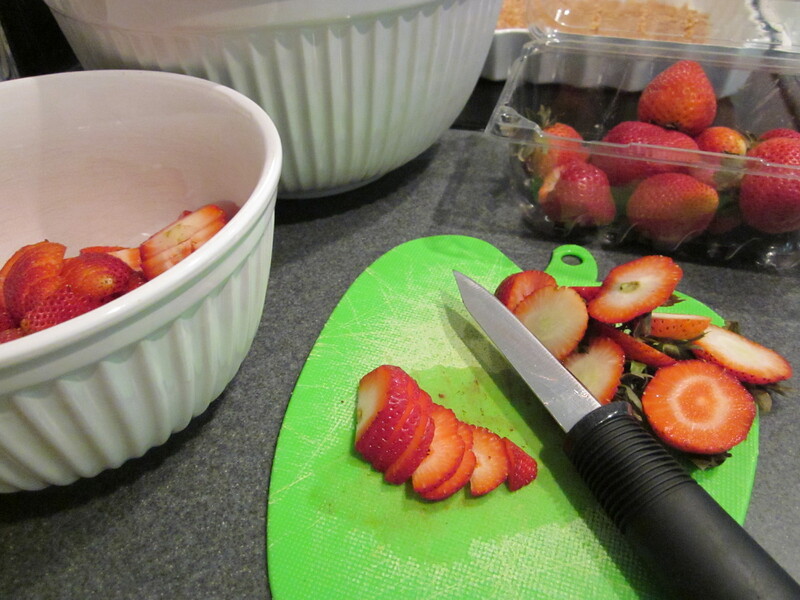 While the crust is baking, slice strawberries and put them in a bowl in the freezer. The cold strawberries will help the gelatin set up faster. 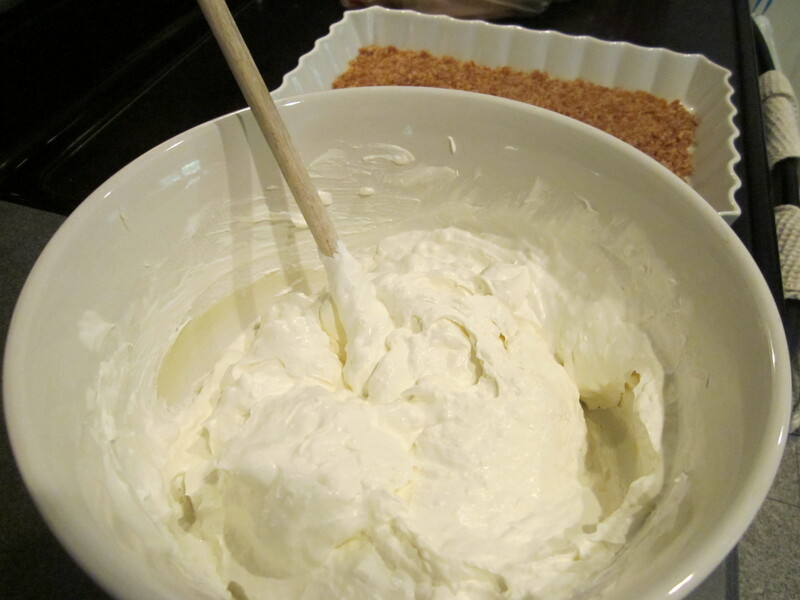 In a large bowl, combine cream cheese and sugar, and stir until smooth. 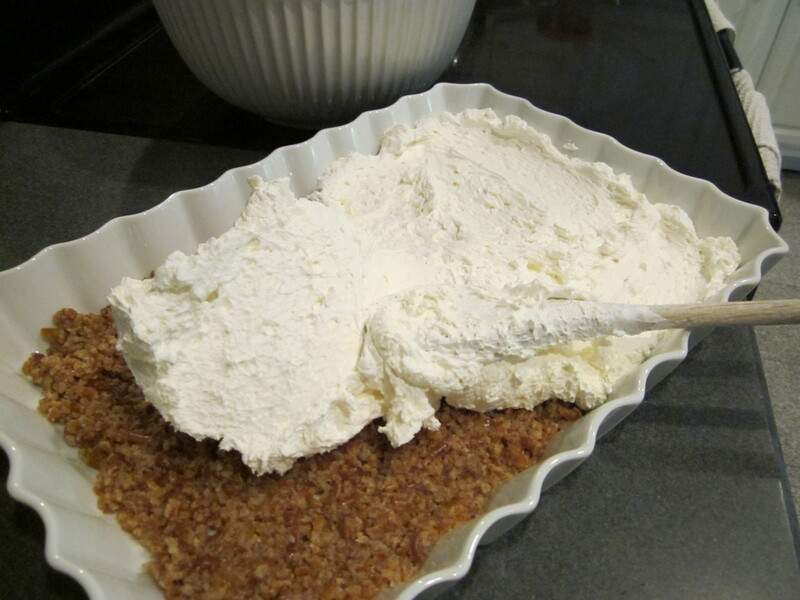 Add the Cool Whip and continuing stirring until cream cheese is combined, and the texture is smooth again. Spread the cream cheese mixture evenly over the cooled pretzel crust. Make sure the cream mixture is against the edges of the pan to prevent the Jell-O mix from seeping through. 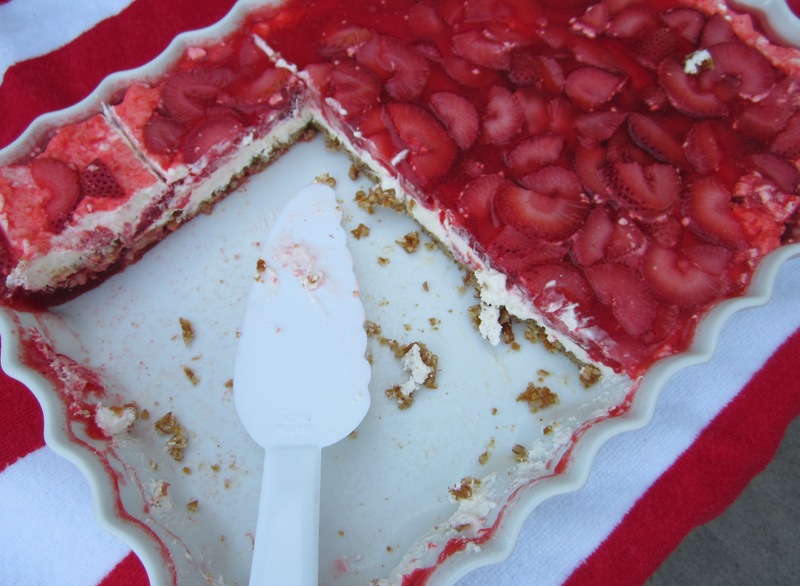 Place the pan with the crust and cream layers in the refrigerator while you mix the Jell-O. Bring 2 cups of water to a boil. Remove from the stove and add strawberry Jell-O. Stir until Jell-O is dissolved. Let sit for a few minutes to cool. Add the strawberries from the freezer and let Jell-O cool a little more. 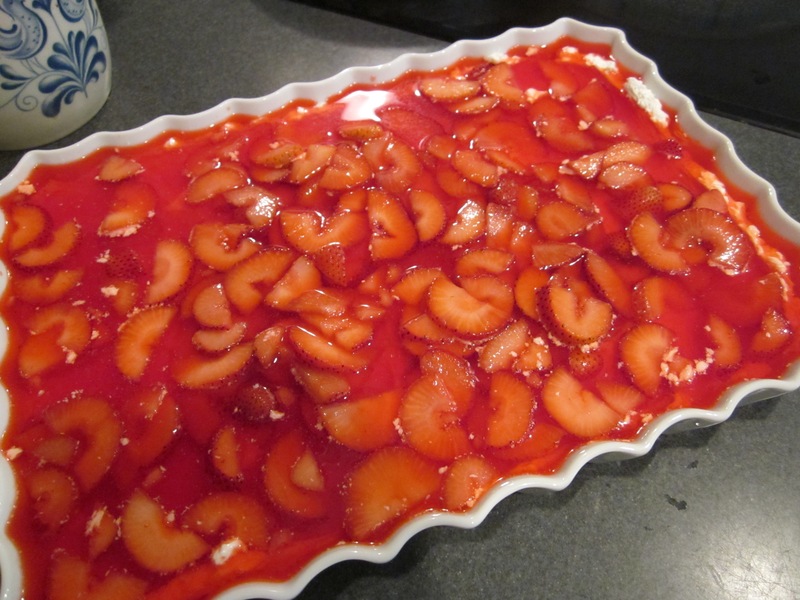 Remove the pan from the refrigerator and carefully poor the Jell-O mix over the cream layer. Put pan back in the refrigerator until the Jell-O is set. It will take a minimum of 1 hour. If the Jell-O is too hot when you pour over the cream layer, it will leak through. This will not ruin the taste of the dish, but it won’t look as pretty. Skinny pretzel sticks or the tic-tac-toe board pretzel shapes work well. You can crush in a food processor or put the pretzels in a Ziploc bag and run a rolling pin over them. Pretzel crushing is a great job for littler helpers. There are many versions of this dessert, and I compared several recipes. The ingredient list and amounts stay about the same. You may want to add a few more scoops of Cool Whip than what I listed.